The booking DANCE FESTIVAL is the brain-child of Producer Jodi Kaplan, born with the intention of creating a cultural exchange between performing artists and international communities. The Festival occurs annually in Edinburgh during The Fringe and at different locations around the globe, continually bridging dance artists and audiences worldwide. Through both performances and educational outreach, the festival offers underserved dance companies the opportunity to expand their visibility to a global scale. Selected companies benefit through advantageous international press coverage and potential future touring in regions of Booking DANCE FESTIVALS. Festivals are timed in coordination with large-scale events such as the Olympics and existing arts festivals to position artists for optimum visibility and access to international press and presenters. Helping artists help themselves and helping artists help each other. Booking DANCE FESTIVALS select USA artists to perform with top local artists in an effort to foster cultural exchange and additional visibility for selected companies. Bridging political gaps through cultural connections. Booking DANCE FESTIVALS in Beijing 2008 and Africa (upcoming) aim to bring USA dance companies to countries and areas of the world that otherwise would never be able to afford to bring selected artists. Many big name dance companies get governmental support to tour to third-world countries (mostly non-American), but other noteworthy highly recognized dance artists from the USA have not yet had the opportunity to perform in the countries. Culturally, the third world is distanced from USA dance. Olympic booking DANCE FESTIVALS are a celebration of the movement of the human body. Dancers are athletes. It is important to position the art of dance as a backdrop to the Olympics, complementing the competition with culture. This offers selected artists the unique opportunity to increase international exposure exponentially. Beijing 2008 and London 2012. 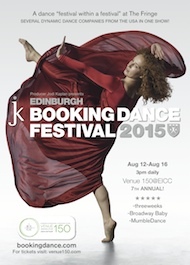 Jodi Kaplan / Booking Dance celebrates their 7th anniversary as a dance “festival within a festival” at the Edinburgh Fringe. Presenting several dynamic dance companies from America in one show - this year’s program is sure to captivate audiences as an ongoing festival favourite. Click Here for more information. Click Here for information on this most recent Booking Dance Festival featuring the art of rhythm – with tap and Indian formats alike alongside the most celebrated contemporary, ballet and jazz dance artists from America. Click Here for information on this festival, featuring Bob Fosse work and a special guest from Mozambique, Africa. Click Here for Information on this most recent festival, coinciding with the 2012 Summer Olympics in London. Click Here for information on this festival which was featured on the BBC World News. Click Here for information on this festival, lasting two weeks during The Fringe. Click Here for Information on this second festival, coinciding with The Fringe in Edinburgh. "Executive Producer Jodi Kaplan has put together an incredible, vastly exciting and most unusual “Festival within a Festival” with her Booking Dance Festival. This past summer I had the remarkable opportunity to open Booking Dance Festival with a world premiere solo and the experience was amazing in every sense: I was treated with the utmost care and respect from Jodi and her staff, I performed alongside some of the most talented and charismatic dance artists working in the United States today, the stage and theater were world class, as was the tech staff, and audiences and critics alike were wildly enthusiastic"
"Performing at the Venue 150 was an amazing experience! I was impressed that Booking Dance Festival was able to secure this beautiful location amidst all the other theaters participating in the festival. The staff was friendly and helpful with all the needs of my company. Each day was well organized, and I felt secure that all my technical needs were being met each day. Thank you Jodi!" "Booking Dance Festival 2010 was a blast! The preparation with Jodi's staff was very thorough, making our arrival and transition into performance mode seamless. Jodi and her team of interns as well as the theater's crew and technical directors were so professional, accommodating, and friendly! The crowds and atmosphere at Venue 15 @ EICC were uplifting and inspirational and carried all of us performers through a physically grueling week. After those triumphs and successes, all that's left is to follow-up with presenters!" “Our trip to Edinburgh Scotland as part of the Edinburgh Fringe festival was a truly unique and amazing experience. The city of Edinburgh itself is a magical place to be for its beauty, friendliness and ease. It was such a treat to perform in such a large and accommodating venue. Every person we worked with including the other dancers, was professional, helpful and did his or her job with exceptional skill. Jodi kept things running smoothly and made us feel comfortable and appreciated. Gigs like this don't come around every day and we were honored to be a part of it." 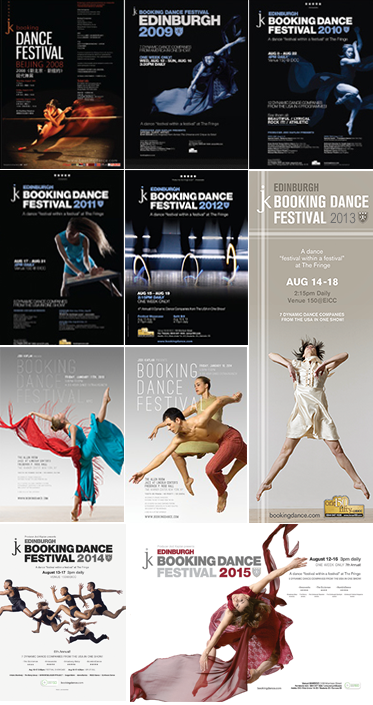 "Our company was so happy to have been invited to participate in Booking Dance Festival, 2010. Being in this well-curated dance festival in the company of respected, beautiful artists was a valuable experience for us. We were able to perform at the beautiful EICC everyday, in the streets of Edinburgh, and see several shows and events produced at the Fringe. Due to the diligent efforts of Jodi and the press team, we had such widespread exposure. We were honored to have received such positive reviews from major Scottish publications." A dance "festival within a festival" at the Edinburgh Fringe! "Festival within a Festival" at The Fringe in Edinburgh, Scotland. Back in 2015 with all new dynamic dance artists!